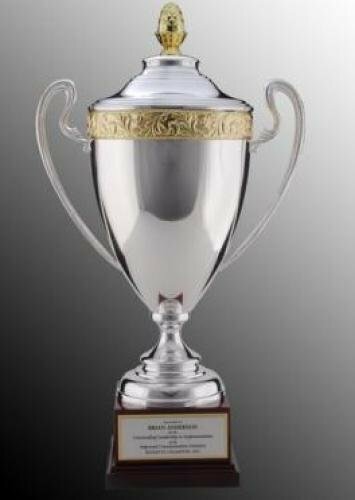 Our Award Cup Trophies are made of metal in silver and/or gold color attached to a solid marble base. These loving cup trophies have a beauty all their own. 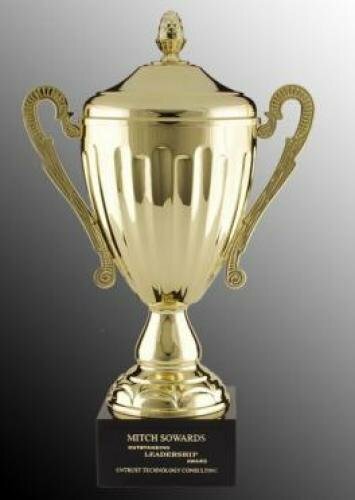 Personalize your award cup trophy with a team message, or individual message to present to those true and only winners. An Elegant Gold Metal Cup on Gold Pedestal and Genuine Black Marble Base. An Elegant Georgian Nickel Plated Golf Club Cup with Sculpted Handles, mounted on a Nickel Plated Base with Black Trim Bottom. The cup, handles and lid are gold plated metal. The pedestal is genuine black marble. 10 3/4" - Base 3 3/4" x 2"
13" - Base 4 1/2" x 2"
14" - Base 4 3/4" x 2 1/4"
15 1/2" - Base 5 1/2" x 2 3/4"
17" - Base 6 1/4" x 2 3/4"
Beautiful Italian award cup on a rosewood pedestal. The cup, lid and handles are silver plated metal and the cup trimmings are gold. 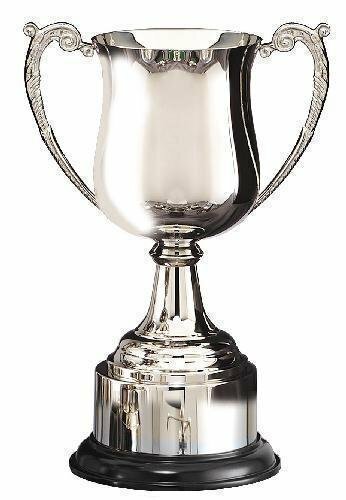 An Elegant Engravable Silver Plated Italian Cup with High Polish, Styled Handles and Wood Finish Base.